Three British soldiers killed when the armoured vehicle they were travelling in was hit by an improvised explosive device in Afghanistan last month have been repatriated. The bodies of soldiers killed in Afghanistan have returned to the UK. Corporal William Savage, Fusilier Samuel Flint and Private Robert Hetherington were killed when their armoured vehicle hit a roadside bomb. Their coffins were driven through Brize Norton. Corporal William Savage, Fusilier Samuel Flint and Private Robert Hetherington have been repatriated back to the UK from Afghanistan. The soliders were travelling in a Mastiff armoured vehicle when it hit a roadside bomb on a routine patrol in Nahr-e Saraj, Helmand Province. 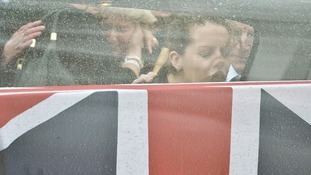 The family of Robert Hetherington have requested that the media do not show images of the soldier's coffin. The plane bringing home Corporal William Savage, Fusilier Samuel Flint and Private Robert Hetherington has just landed at RAF Brize Norton. Close family will spend time with the coffins before the cortege passes through the village of Carterton where friends and family will pay their respects as a memorial bell tolls. Tributes have been paid to Private Robert Murray Hetherington killed in an IED blast whilst on patrol in an armoured vehicle in Helmand, whose body will be repatriated today. Robert played lacross for Scotland and was described as "a dear friend, a true gentleman and a legend who will always be remembered." 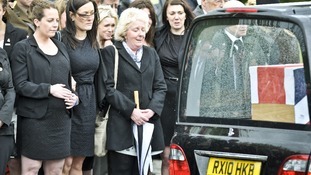 "Sam was always the life and soul of the party, a real ladies man, witty funny, the real cheeky chappy. "He was a loving son, the protective brother, courageous nephew, the caring uncle, the loyal grandson that anyone would wish to have." "I have lost the love of my life and the father of our son. I know his life will live on through so many amazing memories that we shared together." The bodies of three soldiers killed in Afghanistan last week will be repatriated later today. Corporal William Thomas Savage and Fusilier Samuel Flint, from The Royal Highland Fusiliers, 2nd Battalion of the Royal Regiment of Scotland, and Private Robert Murray Hetherington from 51st Highland, 7th Battalion The Royal Regiment of Scotland will be flown back to the UK later today. The were killed when their Mastiff armoured vehicle hit an IED on a routine patrol in Helmand province on April 30.